Today we had a Disney Cars themed birthday party and it was a huge hit! We were so scared about rain for the afternoon, but luckily it held off until about 20 minutes after the guests left. What great timing! Here are a few of the ideas we had for decorations, games and activities. For decorations, we used some Cars decorations from the party store along with additional décor like streamers, balloons, plates and napkins in Lightning McQueen red and yellow. Our first game was a bean bag toss. For bean bags my mom actually made plastic bags of REAL (dried) beans, and then covered them with checkered flag napkins wrapped with clear tape. The kids then threw the bags, aiming for a car tire. The younger the kid, the closer they were allowed to stand to the tire. Everyone got to throw all 3 bags and see if they could make them into the tire. Very simple, but fun! Next up was our super fun obstacle course!!! It carried on the racing them with orange road constructions pylons and a checkered flag “Finish Line” sign. 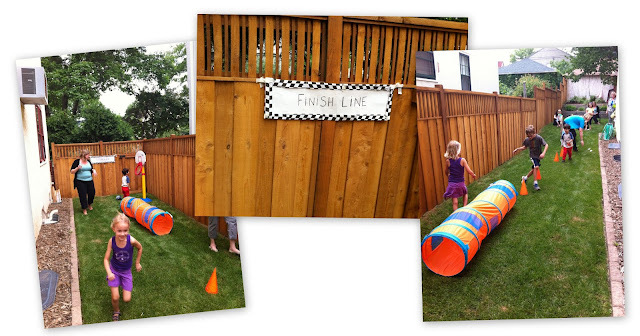 For our obstacle course we started with a slide, had the kids weave through the cones (well, those that could figure out how to weave did), climbing through a tunnel and then making a basket before touching the finish line sign. We had planned on using a stop watch to get race times, but everyone had too much fun running through the course over and over that it was just a little bit of chaos. We even had a Mom who wanted to get in on the fun! Our last game is an old-school classic – the water and spoon race. To be honest, I thought this one would be a flop (it was Mom’s idea), but the kids loved it. All you do is get a large bowl of water and give each kid a spoon. Divide the kids into two teams (we did girls vs. boys since it worked well with our age ranges). Each team gets a “finish line” cup placed 8 to 10 feet away from the starting water bowl. The object is to use your spoon to scoop up water and then walk to your cup trying not to spill any and dump it in. We used a 3-minute timer and whichever team filled their cup the highest won. For prizes we used little snack bags of animal crackers and Teddy Grahams, as well as a Piston Cup! Those were made from little plastic trophies purchased at the party store and we added a red number 1 in red glitter paint. Everyone won a Piston Cup and was very happy to do so. We finished up the activities with a grand finale of a Lightning McQueen piñata. Ours came from Target – you can find it in the store in the stationery section or on Target.com. 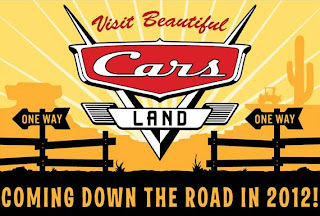 All in all it was a great party and it has made me even more excited about my trip next month to see the new Cars Land at Disneyland! You can read more about that trip here. Wow! So many great details in your party. I love all of the games. I haven’t heard of the water game before but I can see how the kids would get a kick out of that. I love that your mom is helping to think of games. My mom always does that too with games she played as a child. 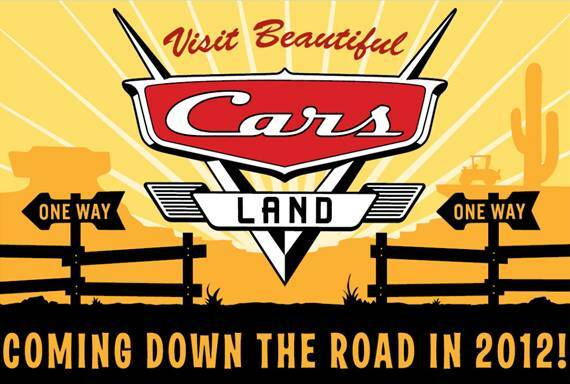 Isn’t Cars Land amazing? We went there this past March and absolutely loved it! I love that you made your bean bags. I need to do that with my kids. 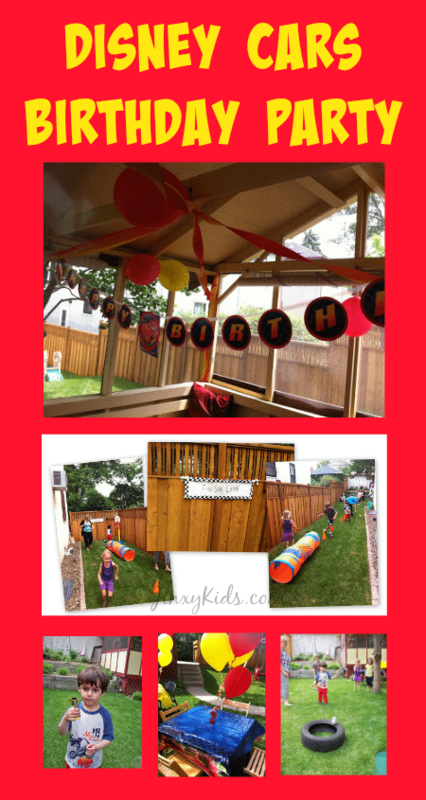 Thanks for linking up to Party Time on Moms & Munchkins and we hope to see you next week!